The FCC’s Authority Over Broadband Access: The Third Way – What Happens Next? Kevin Werbach: We’re going to move on to focus on the issue of the day which is the path of the FCC has proposed to take and should take on the question of its legal authority. So the starting point here as of today is the proposal that Chairman Genachowski has set forth for the commission which he calls The Third Way Approach of classifying the transmission component of broadband internet access as a title to telecommunication service and then forbearing from the application of certain rules in order to get to a more appropriate level of regulation. The four people on this panel – let me introduce them all before we start. Jim Speta, a professor at Northwestern University Law School has written prolifically on telecom policy topics including this one in particular. He has written a number of pieces going back several years well before we had the current debate on the question of the FCC’s legal authority over broadband, before that worked at the law firm at Sidley & Austin. To his left, Susan Crawford, a professor at University of Michigan Law School was on leave last year as Special Assistant to the President for Science, Technology, and Innovation Policy at the National Economic Council. She’s also been a board member of ICANN, the founder of OneWebDay and was earlier partner at Wilmer, Cutler. To her left is Yochai Benkler who you’ve already met. Yochai is the Berkman Professor of Entrepreneurial Legal Studies at Harvard, author of the book, The Wealth of Networks. And then finally at the end, Jon Nuechterlein, a partner at Wilmer Hale, before that served at the FCC as Deputy General Counsel involved in some of the key litigation around the ’96 Act and previously had been at the Solicitor General’s Office and he’s the co-author with Phil Weiser of the book, Digital Crossroads: American Telecommunications Policy in the Internet Age. So a group of people who bring a wealth of expertise to this question on a lot of levels, let me start off by just posing the basic question here that the Chairman of the FCC has proposed this direction trying to resolve this conundrum that we talked about in the last panel, the so-called Third Way Approach. What’s your take on – is this the right way to go and will it be successful? We’ll start with you, Jim. Jim Speta: I think that’s two different questions for me, if not, five. The basic structure of the substantive regulatory proposal seems to me to be right. Generally when I’ve been writing about what the regulatory structure for broadband ought to look like, I’ve focused on the interconnection authority something like an non-discrimination authority although my preference is for a non-discrimination rule that finds non-discrimination to be a problem when there is foreclosure as opposed to a non-discrimination rule that finds non-discrimination to be a problem based on the strong presumption that non-discrimination is a problem because it’s likely to be foreclosure or some other problem and you can see the difference there. Some of the other things about whether the FCC or the FTC is the best place for privacy regulation of the broadband, you know, infrastructure security regulation I think or details that I don’t feel strongly one way or about, their maintenance of Section 208 I think is right. I’ve often argue that the FCC’s should be the center of regulatory authority instead of the FTC because of the availability of private complaint proceedings and the theoretic ability to resolve issues, but before I am sanguine about that, the FCC in my view needs a serious upgrade in its ability to handle and resolve things in a judicatory manner and in a manner that precedes adjudication by engaging self-regulatory organizations or other things in setting, for example, standards of reasonable network management on a going forward basis. So I’m not sanguine about that part of the proposal because I just don’t think the regulatory infrastructure is there. That’s the substantive issue though I think it’s sort of a good idea. Will it be successful? I think it reverts to the question of regulatory authority and Kevin’s right, that I’ve been writing for almost 8 or 9 years now saying that the FCC didn’t have Title I authority over the internet. So let me make a micro-point and a macro-point. The micro-point was adverted to on the first panel that is, does the FCC have authority to change its mind and reclassify and the micro-point is under the analysis of brand X, I think there’s a pretty good microanalysis that this was a Chevron step two issue. The court said that neither result is commanded by the language of the Act and therefore the agency can change its mind and if you take FOX Television seriously, I mean it is a Supreme Court opinion so you should take it seriously. We don’t have to, right? Kevin Werbach: Take the case seriously, not take FOX Television seriously. Kevin Werbach: Okay just clarifying your term. Jim Speta: Yes. The FOX Television fleeting indecency is that what it’s called case? Jim Speta: Fleeting expletives whatever, also something the FCC should not be in the business of having to do it all. Agencies can change their mind. It’s sort of a fundamental principle of administrative law. Agencies can change their mind. The macro-point I want to make is and it’s sort of a first principle point to me which is agencies have authority to act when that authority is given by Congress and that to me was the fundamental point that drove my position on the Title I authority and that even though the opinion from the DC Circuit and the Comcast case walks through all of the myriad little sections of the Communications Act that were at play in that case, the fundamental proposition was we look at the statute and we don’t see in Title I that the FCC should have authority to regulate the internet, okay? So what is the fundamental principle that I want to apply to this case? Well Congress has not made a delegation to the FCC to regulate all communication services. Okay that argument has been made from time to time and it’s been solidly rejected, the Comcast decision is just the most recent. So whether they have the authority, do they have the authority to regulate common carrier services? Then and asking the question is broadband, the telecommunication service or a common carrier service, I think we have to separate out what our little questions and big questions, right? There had been a series of little questions over the years, protocol conversion cases, frame relay, is frame relay a common carrier service? Are dark fiber services common carrier services and I’m fine with the FCC answering those little cases but I also look at the Communications Act and I don’t see a fundamental delegation to the agency to say that any communication service is a common carrier service and the circularity of the statutory definition which was referred to in the first panel is resolved in my mind by context and that is how we have always resolved these fundamental issues of what did Congress mean when it created a delegation of authority to an administrative agency. And the context to my mind doesn’t support a view that Congress delegated to the agency this sort of fundamental authority to decide that the internet is a common carrier service. Now the argument on the other side and it is a good argument is that that’s exactly what Congress did in Section 706 when it said – it was talking about advanced telecommunications services. I don’t read it that way because Section 706 does not seem to be a grant of regulatory authority. It seems to be a grant of if you happen to find yourself with regulatory authority over this advanced stuff, please consider divesting yourself of that regulatory authority. Why do I say all of that? I think the micro-argument in a court might well carry the day. My concern for the FCC’s proposal is that it’s not a stable one, okay? And while I agree with most of the legal analysis in the Austin Schlick memorandum, the part I don’t agree with is the part that comes at the end where he says, a grant of forbearance is very hard to reverse, right? The fundamental proposition that the memorandum and that I begin with is that agencies can change their mind, right? You have to believe that in order to believe that the FCC can reclassify and so if you believe that, then you have to believe that agencies can change their mind about forbearance too. And so the solution proposed while I’m great with it sort of on a policy level of what regulatory authority the FCC should do, I don’t think this path is stable enough for me and so I’d like Congress to do it. Now a colleague of mine who’s always disagreed with my view of the FCC’s regulatory authority has said to me, every time Congress gets involved, things get worse. I don’t think I agree with that and I really don’t want to believe it even if maybe there’s some empirical evidence for it. Jim Speta: So the rule – so that’s my view. Jim Speta: Is that opening statement? Kevin Werbach: I think it is. Yes. Kevin Werbach: We’ll take more into all of that stuff, Susan. Susan Crawford: Well this can be a very interesting conversation. I agree with Jim on the first step which is that the FCC clearly has legal authority to reclassify. If you look at the definition of telecommunications in the Act, something the first panel was careful to do, you’ll see that high-speed internet access is indeed logically understood – could be logically understood as a telecommunications service. The FCC can change its mind if it has an adequate record to do so. I was very moved by John Windhausen’s discussion earlier this morning about the fact that Congress wasn’t clueless when it set up this context and the context is long standing, that there is a difference between basic access service and services that run on top of that service. So when Jim says Congress didn’t mean to delegate to the FCC the authority to regulate the internet, I think he’s used the word munging together several layers of the relevant discussion. What we’re really talking about here is that transmission component, the on-ramps is the way the FCC is putting it, I think that makes a lot of sense and it has a very, very long history in statutory authority in Acts of the FCC long before the 1996 Act. And in our general concerns, again as John said about making sure that basic transport inputs into our economy should be subject to non-discrimination rules because of their effect on what everybody else can do on the availability of competition, that in fact it takes government intervention in these very limited areas to ensure that free competition can exist where there are – there’s the potential of basic services that would not be related at all. We need clarity. This is a centerpiece of the United States economy. We can’t allow smoke to fill the room when we’re talking about high-speed internet access. The FCC should not wait for Congress. The Congress will not be able to pass a new telecom act in the next 5 years, that’s my prediction and a lot is going to happen in the internet economy between now in the passage of any restatement of that Act. So you know, you can’t really step backwards here. We have relied on bureaucratic agency to have the flexibility, responsiveness, and knowledge of real-time markets that’s needed for these basic inputs into our economy. We shouldn’t cut ourselves off with the needs by not allowing the FCC to go into this area. Here’s where things get really gray. Both sides overstate their case. The carrier say wave the flag of Title II and we stop investing. The other side says, that’s completely false, in fact investment has gone down in capital expenditures during the deregulatory period and we can’t anticipate that regulation will have any impact on that. This is truly a gate gray area that can only be decided I think according to your principles. What do you think is important? There are maybe many inputs into a carrier’s decision to invest an infrastructure. One of them might be regulation, very difficult to say how important that input is. But if we continue to believe that for basic transport and communications inputs into our economy, administrative agency needs to be on guard, needs to be the watch guard. We need to go to that direction. That’s the right thing to do and this FCC and this administration were brought here to Washington to do the hard things. This is a hard thing and we need to see the agency having a very careful process, I know they’re going to do it, and I actually think they don’t have much of an option if they want to remain a relevant regulatory body in the era of the internet other than reclassification. Yochai Benkler: So it’s great to be able to get a chance to listen to these very different perspectives but to also emphasize to you the one important convergence point between both of these statements is that a matter of legal prediction of what will hold up in court. Reclassification will likely hold up in court. This is what Jim described as the micro, then he spent time explaining why he wouldn’t necessarily think it’s a great idea in a certain way but as a matter of prediction and stability of investment and knowing what the direction is. There is a convergence on the fact that once you take the Act and its definitions, once you take brand X, this is something that is likely to hold up. That’s an important fact. Particularly it’s an important fact in the context of the Comcast decision that basically says, if you stay in Title I, what you need to do is go and litigate each particular application to see whether you can find something to anchor it in. So in terms of just being able to say, here’s the framework, we’ll argue about the boundaries and that will be important but here’s the framework, I think it’s important to recognize that as a pure matter of prediction of legal strategy, between the strategy of trying to tweak Title I and go back and fix it over time and the strategy of reclassifying plus forbearance, the one that’s more likely not to be reversed is that one, which leads really only the third option which is to do nothing on the assumption that Congress will step in. And I want to agree with Susan at some level and disagree at another level about the relationship between this decision and the probability of congressional actions, because the structure of Congress is many veto points. And so the degree to which you have likelihood of passage depends on whether or not there’s a very strong emphasis on keeping things as they are, who the status quo presses on? And so when you have the current state, if the commission basically doesn’t either do the – let’s litigate over and over Title I or reclassify and wait for Congress is regulatory limbo on this basic market in broadband access carriage to the home which means that it’s a context of unregulated, very imperfect market and a push to regulate it. The veto points in this regard help incumbents which means that you have a very strong political dynamic to prevent action without a [Indiscernible] [0:18:28]. Whereas when you put in place reclassification, you get two effects. One is you actually have somebody to try to see if something happens, if new facts emerge over the next two, three, five, however many years there’s a response, but you also potentially – if you want congressional action, you change the dynamics. Let’s not forget the statement that was made this morning. The ’96 Act was passed almost unanimously because the alternative was Antitrust Law under the modified final judgment and that was something that was unacceptable to everyone across the board and that pushed. So I think it’s a matter of will it succeed as to prediction of what the courts will decide based on brand X, it’s more likely to succeed than the other strategies as a prediction for given that the alternative is either this or regulatory limbo for some unspecified number of years I think it’s preferable. And the main thing that I want to emphasize is the question of the substance and on this to think about going back again to this morning’s panel, to think about the relationship between whether you need an expert agency at all that has the flexibility to collect information, respond to market conditions, change the regulatory environment or whether you don’t want something like that, and if you want something like that, what it needs to focus on and what are the things that we need to recognize is that we don’t have an option here of free efficient market and heavy-handed regulation. What we have is a market that’s extremely complicated that includes components that can be competitive and includes components with enormously high barriers to entry – that prevent entry. So one of the things that change over the last decade is 10, 12 years ago people could credibly talk about facilities-based competition creating a competitive market. Now we have a national broadband plan report that says 96% of US homes have access to two or fewer. Only 4% actually have. Now is duopoly an efficient market? I don’t think there are arguments that duopoly is an efficient market. Is it better than monopoly? Maybe yes, maybe no depending on how it also affects the political economy of regulation and whether there is or isn’t political will and political push back to regulate. It’s not an efficient market. So you’re stuck with this problem that you have a technical and economic situation of a systematically inefficient market and a strong history of people being very worried about excessive regulation and an effort to still bring in markets wherever possible and that’s the regulatory problem that’s been in front of the FCC, that’s been in front of regulators everywhere in advanced markets is how to create these frameworks. My concern is that the very strong and explicit forbearance in this regard on the mirror image of Jim’s concern that it’s too easy to change the forbearance is that this very strong statements about how high the barrier the commission believes is to change forbearance, actually understate that the gray to which their role is to look at a systematically inefficient market that can only work with continuous steering and a context in which you actually look at competition and emphasize competition. So interconnection is important, as you say, Jim but interconnection takes care only of network externalities which is one inefficient. It doesn’t take care of high entry barriers; it doesn’t take care of stickiness of customers and switching costs. So it’s part of the solution but only if you think that the problem is network externalities and you need to continuously look at that. So I’m sure that in the conversation we’ll get more into investment but the one thing that I think is also important is effect on investment is not just a matter of theory even though the theory itself is also not at all clear which way it goes. It’s also empirical and the empirical evidence is very, very mixed and very modeled. And to talk about investment and the effects of this particular regulatory reclassification, this is an investment. In the content of this kind of a market decline is very problematic and so I’d be very cautious about making that claim. Jon Nuechterlein: Thank you. I’d like to begin with a quick disclosure, a disclaimer. I am the only practicing lawyer on the panel. I represent broadband companies in this. The disclaimer is that I’m not speaking for them here. I’m speaking only for myself. I don’t want to address the first question of the prospect of appellate litigation. I really hate to be the one who spoils the cozy consensus on this but I am not at all sanguined that the FCC’s Title II reclassification if they undertake that would be upheld. In my view they would have a less than 50/50 chance of prevailing although it is a complicated set of issues and we won’t really know for a few years. In public discussions about that issue, most of the points you hear made or made at 50,000 feet. You know, you hear arguments to the effect that Justice Scalia was correct in his dissent. In fact it appears in the general counsel’s separate statement on this. Never mind that Justice Scalia was in dissent and disagreed with the majority on key issues of statutory interpretation. You also hear from 50,000 feet that the statute was ambiguous and we know that agencies have a lot of discretion to change their minds. The problem is that appellate litigation – know this is an appellate litigator is not resolved at 50,000 feet. It is resolved at 500 feet and the FCC can’t reverse course here simply by flicking a switch from roman numeral I to roman numeral II and then explaining that it thinks that, that isn’t appellate interest. Instead it has to make very specific factual findings about the technical details of what consumers receive when they purchase broadband services. Do they get this for all transmission or do they also get and assume that they all get information service functionalities as well and have any of those facts change over the last few years after the FCC repeatedly found that this is an integrated service? And bear in mind that the FCC has never before held that integrated service with information service functionalities has been – that contains telecommunications service component and that goes to an important point about the computer inquiry rules that I want to turn to in a minute. All this is – I’ve set out from my point that I hope that Congress steps in and comes to the FCC’s rescue here and that the FCC holds off before it does and there’s a very interesting political dynamic that play here with lots of interests at stake. The FCC rightly perceives that for the first time in a long time, many in the industry would support congressional ratification of a baseline set of principles. In fact they are the same principles that have been adopted by the FCC over the last 5 years. There is never going to be a better time than right now with democratically-controlled houses of congress for Congress to act. The worse case scenario from the perspective of people who favor the subsequent consequence of reclassification is to put this issue off for a few years while the issue of statutory classification works its way through the course because if the Title II reclassification is invalidated, then there is no guarantee; A that the industry would support any congressional action or that both houses of congress will be democratic as they are today. This is an important moment to seize. If we don’t seize it, I’m fearful that we will have many years of uncertainty and I know by the way what an FCC appellate looks like because I was on the FCC’s side of one 10 years ago. I worked in the SG’s office in the late ’90s before I joined. The condition is Deputy GC in 2000 and for 5 years, we had to keep going back to the Supreme Court to undo all the damage that a hostile Eight Circuit panel had done to the FCC’s regulatory agenda under the ’96 Act and I will tell you at that time, that we thought that our regulatory agenda was consummately defendable and very good public policy. At the FCC, we were in the grips of a hostile panel that can happen again and you cannot underestimate the degree of regulatory uncertainty to that cause and it infected the industry for about half a dozen years. I don’t want to see that happen again. One way to keep it from happening is for Congress to adopt first principles to give the FCC the authority that it needs so that people can’t litigate about whether it actually has that authority and gives the FCC a faired amount of discretion to implement that if it sees fit. The second set of questions presented here is if you assume that the FCC has the authority to do Title II reclassification, does it make sense for it to adopt that scheme? And I want to begin with the point of consensus and then move on to why I think Title II reclassification is as John Nakahata described it earlier, a clumsy tool for accomplishing that. There is a lot of consensus that in public policy and this is at 100,000 feet that in public policy generally, of course we want greater government supervision of industries where market power is endemic where the barriers to entry are high and where the prospect for consumer harm is greater than elsewhere. And we particularly want the government to be involved in protecting the internet against abuses by companies with dominant market positions. I want to contrast now the telecommunications market where you have some competition with other markets that are equally integral to the future of the internet and when you think about what is it they were trying to accomplish here? What we are trying to accomplish is to enable innovation at the edge – you want innovators at the edge to be able to deliver their applications in a highly efficient consumer-friendly way to consumers. Who stands – who potentially? If they have market power stands between edge providers and consumers, it’s not just or even primarily the transferred layer. It is also for example the providers of operating systems, Microsoft for example is an acknowledged monopolist in that market and it has been for many years. If you’re an applications provider and Microsoft doesn’t want to cooperate with you, you’re going to find it very hard as Netscape discovered to bring your products to the public at large. Search engines, Google has a 70% share of the search market. They say that competition is just one click away but it seems that Google is doing something awfully right and either they institutionally or ahead of the curve that return or they are leveraging the benefit from their multi-billion dollar investment in CDNs in server farms. It could be one of these things, many events. I think there’s little question that Google has market power now. So how do we deal with these issues? I’m not advocating regulation of those companies. I do not want there to be a federal operating system commission or a federal search engine commission. We rely on antitrust to make sure that Microsoft does not keep Netscape from communicating with the public. We rely on antitrust to make sure that search engines do not corrupt the fabric of the web. We have a long tradition in our country of relying on a regulatory agency rather than antitrust enforcers to make sure that the communications market is sound. One reason we relied on regulators is because we had price regulation. Antitrust enforcers don’t do price regulation very well. We’re now in an era where you’re not going to have price regulation or so the FCC tells us, so it’s not immediately clear why it’s essential for the FCC to play a key role in this area as opposed to for example the Federal Trade Commission Act at Section 5 authority. That’s my general introduction to this. I will very quickly now say why I think Title II is an odd vehicle for trying to address the sorts of issues that I think there is a consensus to address. Title II reclassification would be both under-inclusive and over-inclusive. Here’s the basic problem with it. Title II reclassification would rely exclusively on statutory definitions that were written – that were derived from a mid-80s regulatory construct developed under the computer inquiries regime. This was the regime that required telephone companies which Denver and Minneapolis in the transmission market to unbundle, in other words, strip out the transmission component of their services and offer those under Title II. If you are an information service provider like EarthLink, you could then get the underlying telecommunications component and you could sell it not regulated under Title II because there never was an integrated service with an information service component that was regulated on Title II. Instead the commission ensured the integrity of the market in this monopolistic environment by having this unbundling requirement. Guess what? And this is something that I think the first panel began to talk about but didn’t explore in greater length. This FCC has already told us that they are not interested in reimposing the unbundling requirement but they are trying to avail themselves of statutory classifications that were designed to implement that unbundling requirement and the result of that, they very well be a square peg around a hole in two respects. First, over-inclusiveness. The statutory definitions here do not roll the sorts of lines that sound public policy is a general matter that would want to be drawn between companies that should be regulated in those that should not. It is not that these statutory definitions do not track the layers model of the internet. They specifically do not track facilities-based versus nonfacilities-based providers. The old unbundling rules did that, that these statutory rules which were an adjunct to those now abandon unbundling rules do not do that. The Supreme Court has confirmed that they do not do that and the important passage in the brand X case, the Supreme Court said that these statutory categories do not map onto any distinction between facilities-based or nonfacilities-based providers. They also do not map onto any distinction between local access providers and long distance providers. So in particular, they do not distinguish between – in the old days, local exchange carriers and IXCs or today between local broadband access providers and internet backbone providers. There are other providers that could also be as a result of this mismatch, there are other providers that could also be swapped up into a reintroduction of the Title II regulatory scheme to this class of services. We could talk about them at greater length later. I just want to close by saying that the additional concern I have with reclassifications not just of this over-inclusive in the sense that I’ve discussed but also under-inclusive because to the extent that the name impetus for reclassification would be reintroduction or introduction codification of net neutrality rules. The FCC again has made it clear that they have no interest in regulating the ISP component of an integrated broadband internet access service. So what happens if net neutrality violations occur at the ISP layer, higher layers of the internet? Well the FCC, as I understand it, claims that okay well then we will address that set of issues under our Title I ancillary jurisdiction but that just gets us back to where we started. But the problem is worse than that because there is a specific provision and the existing Telecommunications Act that says and this is Section 15344, “A telecommunications carrier, in this case a broadband provider, shall be treated as a common carrier under this act only to the extent that it is engaged in providing telecommunications services.” That flatly forbids the FCC from imposing any common carriage type obligation on the ISP side of a bundled broadband internet access service. So bottom line, wouldn’t it be great if we didn’t have to relive these same set of issues which is offly familiar to me from my time at the condition in 2000 which I thought I was able to put behind me. Wouldn’t it be great if Congress just came in and said what we now mean when we say that there used to be a regulation of the physical layer in the portions of the internet or in any other layer in the portions of the internet where Congress believes that there are potential competitive harms so that we can stop having these medieval scholastic disputes about what these words mean and finally what I just said, totally against interest. I’m a practicing lawyer and these set of issues will send my kids to college unless Congress stops. Kevin Werbach: Okay. Well this is a lot to chew on. Let me try and pull back and bifurcate the issues and I know probably all of you want to respond. But let’s start with the first question which is the prospects that reclassification will be upheld. The three of you – the first three seem to be comfortable that the FCC could change its mind, what’s your response to Jon’s argument that the FCC needs to show very specific factual changes? Jim Speta: Well I think it’s right. The FCC does need to show very specific factual changes. I think the FCC working with its engineers and the substantial evidence standard of review has a shot. I didn’t mean to indicate [Indiscernible] [0:37:59] is a great lawyer. I didn’t mean to indicate I thought this was a slam dunk. I actually believe these first principles argument that I made ought to carry a lot of weight to it and I actually thing that, that first principle argument drove what happened in the Comcast decision, it drives what happens in a lot of administrative law cases to pick a non-communications law example, you know, the word drug seems to include nicotine except if you look in the statute and the consequences we don’t find in the statute anywhere that the FDA ought to be regulating tobacco, right? That’s a sort of first principles. If this was what Congress had in mind, you know, it would have been clearer to us. I actually think those. So I think it’s probably north of 50% but not much more north of 50%. That’s you know – and I agree. That’s why Congress ought to get involved. That’s what I mean by it. It’s not stable and in part, you know. Susan Crawford: So I teach brand X and every year my students say, oh my goodness, how could that – it seems so tortured to them this reading with pizza and leashes and dogs and poor Justice Thomas trying to figure out what on earth he’s talking about. You know, it’s – and it looks difficult so let’s just differ. I mean that’s really what brand X is about and the notion I tell you from my students’ perspective, the notion that internet access is an integrated service seems absurd to them because when they buy internet access, they’re looking for speed and price. That’s it. There may be an e-mail account offered with it, there may be some security package that’s offered for free but that’s not what they’re getting. They’re just getting communication between point A and point B.
I’m not saying that Michigan Law students are representative of the public at large, although I hope they are, they’re wonderful people but I do think that the decision in 2002, 2005, 2006, and 2007 pretty tortured. And that the FCC will not have that much difficulty in showing that the facts that a cable company offered this service as an integrated service does not dictate what people think they’re getting, that the whole subject of integration allowed enormous class of companies to effectively deregulate themselves by refusing to offer a pure transmission service. So my cents and I’ve actually got the FOX language here that you know, the Supreme Court says you don’t have to demonstrate that your reasons for your new policy are better than your reasons for the old policy, it just have to show that you’ve got good reasons for doing what you’re doing. And the FCC I believe will be able to show it has good reasons for doing what it’s doing. Now Jon and hordes of other lawyers will be fighting on the other side, it will be a grand battle but I believe it’s one that the FCC can win. Susan Crawford: And there I so strongly agree with you. Boy, look at that statute. Transmission between or among points specified by the user of information that the user is choosing, boy! And offering directly the public. Jon Nuechterlein: Can I interject something here quickly? So, moving back down the 500 feet, the Supreme Court – Susan mentioned that her students don’t look to their ISPs for e-mail anymore maybe that’s true. I know I don’t looked at my ISP for e-mail anymore but I sure do look to my ISP for the same features that the Supreme Court deemed dispensed it in brand X and those are DNS lookup, caching, and increasingly and this is something sort of overlooked is security features. The Supreme Court has already spoken to this. DNS lookup and caching are quintessential information services. They are bundled in with what you buy, you get broadband internet access. I would be pretty disappointed if all I got when I log into my computer was a direct connection to the central office. I would really like to be able to get through the rest of the web but these are again scholastic disputes that against economic self interest I hope I don’t have to be part of because to me, none of these, all these lawyers’ battles to me are little bit embarrassing because we should be talking about big principles, about who should be regulated, who should not be regulated and to what degree. The answer to that question should not turn on how you interpret these statutes. I also want to say one quick thing about FOX, the FOX case. FOX does say that in most circumstances, agencies have broad discussion to change their minds and that in most cases you don’t scrutinize a new decision more heavily than you would if it were the agency’s original decision if there has been a reversal. But the FOX case made a very important exception to that rule and the exception was – actually two exceptions. One was for cases where the agency is reversing itself on key factual determinations in the prior round. The second is when there had been important reliance interest on the agency’s prior decision. Both of those criteria apply here. The FCC would need to reverse itself on a key question of fact and it would need to do so in a way that subverts the expectations over the last 10 years that integrated services with an information service functionality will not be subject even to you know, light touch common carrier regulation. Yochai Benkler: So I think what we’re getting is a short preview of what will occupy many pages but just to emphasize one point and then that response to a couple of the points. Brand X, you correct this set of course that Justice Scalia was in dissent but remember the division between the dissent and the court was not about whether or not the correct definition was one or the other. It was Justice Scalia with Justices Ginsburg and Souter basically saying this is completely unacceptable to do anything other than telecommunications and information services combined. And the other six saying you know, it’s complicated that’s why we have expert agencies, that’s why we have deference, there’s a whole section in the beginning of brand X where Justice Thomas writes you know what, a commission can come, can change its minds, can look at the new fact, that’s what you get a commission and you’re right that it has to be related to the statute. But let’s not forget the Ninth Circuit, the authoritative judicial interpretation up until brand X was that you have cable combining telecommunications and information service. That’s what made them all subject to franchising authority, right? So you have some reasonable judges saying that it’s relevant to the fact. Justice Scalia, Justice Ginsburg, Justice Souter were not making a claim about policy, they were making claim about what was required, so required that the FCC didn’t have jurisdiction to hold otherwise by the statute. So in that regard, I don’t think it’s a general policy question. I think it’s the questions of the best understanding of the service as it relates to these definitions, returning to what the authoritative judicial interpretation over the years has been except for the context in which the judiciary said you know what, you’re the expert agency, we’re judges, judges held this way, expert agency held the other, we’re willing to go along with what you said. Kevin Werbach: So let me get to that. It seems like a lot though depends on this question of how to deal – are there two pieces here and how they come together? So is it feasible and desirable to pull out this transmission component as a discrete construct? Jon Nuechterlein: So I mean I guess I want to return to a point I made before which is it’s important to focus on what we mean when we say pull out a discrete transmission component because the FCC has said and I think they will stick to this that they have no interest in reviving the computer inquiry rules. And what that means is they have no interest in going back to the days when monopoly telephone providers were required to strip out the transmission component of their services and offer them for sale to rival information service providers. I mean no one can test that the FCC at least on the wire line side could probably identify a transmission component that it could force somebody to strip out. It’s much harder to do that by the way on cable side where there never were computer inquiry requirements on the wireless broadband side as well. Those would present engineering challenges which we haven’t yet begun to fathom. But the important point here is that’s not what the FCC is proposing to do. Instead what’s proposing to do is just for regulatory purposes, say that there’s one component of this service whether it’s integrated [Indiscernible] [0:47:57] but there’s one component that we want to subject to Title II regulation. There’s another component, the information service functionality component that we don’t want to subject and we will not subject to the Title II regulation. The question for me is what if all the action is on the ISP side of this and more importantly, how do you delineate a distinction as individual issues come up about what the dividing line is between the broadband component and the ISP component? How does caching for example fit into this? Those are some issues that I think illustrate why this approach is very lawyer-friendly but also a sort of ham-handed as a matter of public policy because you want the FCC just to be able to say okay that functionality presents a special regulatory problem and we’re just going to address it. You don’t want them to have to worry about whether there are these artificial regulatory lines designed in the early 1980s that delimit what it can do and what it can’t do. Yochai Benkler: So to the question of what is a flexible or a ham-handed approach, in a fast moving technology, I’m just not sure why you think that Congress – particularly since you said this is a particular political moment where something in particular could happen, where Congress and congressional action is the idea that when something changes technologically 5 years from now, we go back to Congress to define it or do we always need to set up a system where we have an expert agency with an expert staff with an ability to collect information and to adjust over time. Is it the ideal setting? No, but if you’re talking ham-handed, working through and saying here’s today’s image of the world. Let’s ignore the prediction that in a few years, 85% of homes will only have access to a very high speed internet over cable so that they’ll essentially have a monopoly over next generation’s speeds because that’s not today. Today we have more like a duopoly. Let’s ignore whatever will come down the line and fix today’s congressional understanding. That strikes me as much less flexible and if you’re going to create lines that you draw today, you’re still going to have to go through this providing an expert agency that will face these difficult questions and saying slippery slope in very many directions is a fairly standard legal move, but I’m not sure what the alternatives. Jon Nuechterlein: I think the – I mean as given the choice between regulatory distinctions to bind the agency and the courts, if these distinctions were drawn in 1982 versus distinctions that Congress might drawl today, of those two, I would prefer the latter. It’s not asking too much for Congress to step in every 10 or 20 years to address changes, I was just pointing out to Susan before this that I have a compilation of telecommunications laws issued by the Commerce Committee. The date on this is January 1997 and I still carry this around with me because I don’t need to get a new one. It’s not all the major stuff in it but I guess the other point is the wall that we’re asking, we’d be talking about Congress adopting wouldn’t necessarily have to rest on silos the way that the current law does. There is something inherently silo-oriented about this distinction between information services and telecommunications services. What we really want to get at is to keep broadband internet access providers and this is something that Jessica Rosenworcel was pointing out earlier today. From engaging a certain core behaviors that threaten the integrity and openness of the internet, you can do that pretty easily by having Congress codify the FCC’s internet policy statement and it maybe that additional regulatory challenges arise some years down the road. Luckily we also have antitrust as the backstop which has worked well enough from our policy perspective to deal with the threats that monopolist like Microsoft or even Google might present to the internet. But the basic point here is I don’t – even though again it’s against economic self interest, I think that there is something inherently warping about having silos designed in the early ’80s govern the sorts of regulatory responses that we can adopt today. Susan Crawford: Yes you’re – I would hire you, Jon. Your deftness at moving from layer to layer here is really breathtaking because at one point you’re saying that the computer inquiry definitions should not – are have now been abandoned by the commission and so they now can’t use that as a regulatory matter. I mean we’re talking about actually much larger basic principles here. There’s a difference between the sidewalk and the conversation and that’s what the commission has been saying for many years and what telecommunications regulators all over the world have been saying for many years. The question is whether we continue that distinction so that lots of public goods we want to encourage are made possible. That’s what reclassification would allow or your suggestion is that we go to Congress and deal with a few principles that don’t address all of those other public goods interests. My central point is that we’ve got a basic problem here with Congress has indeed delegated to the FCC the authority to deal with these layers. The layers are not silos, they’re layers and perhaps that makes no difference to you. Jon Nuechterlein: Not as exact. That’s statutory distinction we’re talking about. Again it does not track the layer. Rick Whit did not write the 1996 Act. Jon Nuechterlein: It does not track the layers model of the internet. It would be great if it did. On the other hand, when you distinguish between sidewalks and conversations, I think you need to understand that there are different sidewalks at issue here. Anything, it can be a platform for higher layer things. Anything if there’s sufficient market concentration can defeat higher layer applications and that is as true for operating systems as we learned in the Microsoft issue. Jim Septa: Two very quick points. One is the – not 100-year history but the 30-year history is basically no more common carrier rules for airlines, railroads or trucks, right? I mean, we still apply and do electric but we have a story about why electric has a market structure that we care about. I think [Indiscernible] [0:00:22] highest point about the 10 years down the road are we going to be in the same situation or Kevin’s question about what – where we’re going to be in 2024, is an important one and my solution to this has always been that what the Communications Act does now is it gives the FCC jurisdiction over certain kinds of services very precisely defined as John has been proving and then gives them an enormous public interest hammer over those services very narrowly – not very – but defined as they’re defined and my solution has been to invert that and to give a broader delegation of if you call it subject matter jurisdiction over – I just finished reading the wireless report so I won’t use the word ecosystem. Jim Septa: But over the broadband – am I munging again whatever that means? Susan Crawford: It’s okay. Go ahead. Jim Septa: But, the – when you do that inversion, what you have to do is put stronger substantive requirements, substantive things that the agency must find before it can act such as that this non-discrimination actually results in foreclosure or harm the consumers or something more than just it’s non-discrimination and you restrict the hammer. Right? You restrict the kinds of remedies. You restrict the kinds of formats in which the agency can actually issue rules and adjudications to be something different than what we’ve seen in the past. And in fact, that’s what antitrust does as an intellectual matter. It says the Antitrust Laws apply to everything under the sun. But the government can only put you in trouble if you find the substantive requirements of the Antitrust Laws have been met so the solution is not that we’re – if we ever brought enough subject matter definition, then like John wants us to do, we don’t get in that sort of sophistic debate but we focus on – but when you do that, then you have to cabin the hammer both substantively and remedially. Jon Nuechterlein: Transportation, why is it different. The reason we’ve had substantive regulation rather than antitrust oversights solely of transportation for many years is because historically, that was a regulated industry. Each carrier is entitled to a regulatory compact under which the government would set rates and ensuring a fair rate of return. We don’t live in that world anymore at least in the broadband space. So, I don’t – I still don’t understand why there should be a distinction between different types of platforms that could interfere with communications from the edge to the public. Second point, the FTC, the real third way here is not what the FCC is proposing but the FTC section five jurisdiction. The FTC has authority to address consumer welfare issues as well as unfair methods of competition. Even if they do not rise to the level of the antitrust violations. Now, what’s interesting about this and this is something that very few people picked up on is if the FCC reclassifies broadband under title two, they have just undermined the FTC’s basic argument for getting around its section five common carrier exemption. So in a way, if the FTC moves forward from this, you can imagine a scenario in which the FCC has effectively taken, generalized non-siloed authority from the FTC and given to itself even though it’s subject to these 80s era classifications. Kevin Werbach: So let me just make a couple of comments and then I want to open it up to the questions from the audience. One is part of what we’re having here is an institutional competence argument and without taking sides, the question seems to be to what extent we have the opportunity that of course [Indiscernible] or law professors do is law professors, you just say, let’s in the abstract ask what will be the best way to do this versus look at the situation from the standpoint of a set of players and we would come fairly far down the road in certain directions. There is a national broadband plan. There are a set of proceedings. To what extent can we stop and think about what would be the best way versus moving forward down the path that the FCC has proposed to take. The other dimension is what has struck me about this conversation. Let me ask those of you on the panel but this is right is the – we seem to be having two ways of looking at what the issue is. One is there is – it goes back to the first panel so the way fundamental set of questions that, you know, however one defines what is essential in the nature of this set of industries but there’s – there are long standing policy questions which certainly in telecommunication policy have gone back for many decades and before that. And this is just – the next version of that battle, the other way is looking very specifically at certain policy initiatives so if – it seems like the debate is about open internet rules and how best to achieve them. That’s some of the points that John has been making then this ties into a bunch of specific historical elements of, you know, how we might or might not do that. So is it right that sort of the question here is how specifically one looks at the objective and that helps you understand what the two alternatives are or is the debate about something different than that? Susan Crawford: Can I spend a moment on institutional confidence. 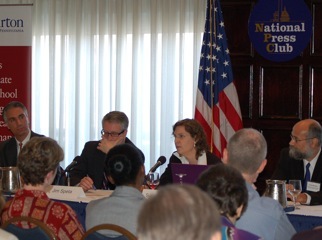 Susan Crawford: And then just take two seconds so the FTC is not interested in regulating infrastructure. They are interested in regulating applications and privacy. And I think it would be very easy to make sure that with whatever the FCC does, it leaves a huge field over to the FTC and in fact, that’s the point of making this clear that these two agencies can stop clashing with each other. In the national broadband plan, the commission makes the point that in just a few years, between 75 and 85 percent of Americans when it comes to high speed internet access suitable for viewing video which is the killer app, those Americans will have just one choice, the local cable monopoly. That’s coming. It’s coming soon. The FCC has predicted this. The cable companies don’t actually compete with each other. Verizon is backing down on its FiOS plans. For that situation it’s going to be important to have an agency like the FCC, an expert agency who can gather information as Yochai says. Make sure it understands the industry. Make sure it understands the entry barriers and pressures to which consumers are subject. Finally, as to what question we’re answering whether the boundary should be specific or not, I think again, a good model for this is in the wireless world in using 332(c) and forbearance, this light touch approach in wireless. The FCC can always come in and talk about things like early termination fees and truth in billing and data roaming if it needs to but doesn’t have to but these public – other public interest elements can be incorporated when appropriate and I think Schlick’s memo clearly states the case that, you know, we’re going to keep on universal service disability access and privacy. So there are certain key areas where the FCC needs to continue to be involved and this third way makes that possible. Kevin Werbach: Alright. Let me – go on [Inaudible]. Yochai Benkler: So to this general question of antitrust versus expert agency, to remind people the last time Antitrust Law really dealt with communications infrastructure was the modified final judgment. There’s a reason for this. It’s complex. It took years. The law wasn’t the kind of law that had to deal with actually what you do when you break up a monopoly, when you do the next generation of it, when you set up a competitive market over time. There was a reason that this was so clunky that at the end of the day, you wanted to get rid of it. Antitrust is built from markets whose baseline is competitive but then there are components where particular behaviors either individually or collectively undermine that. What you see with expert agencies and the idea of an expert agency, particularly in communications and telecommunications is a recognition that there’s a systematic set of problems with this particular market. So this baseline understanding that somehow, there’s a – the market will take care of it all except for certain behaviors is a myth. There are certain technologies and certain context in which the market will systematically predictability not take care of it all. And in those only historically, people thought you just needed a regulated monopoly. That fell flat on its face so everybody in the world depending on where it started here and in UK in the 80s, elsewhere in the 90s went towards privatization and liberalization. That is – and those are two distinct things. Went towards on one hand, the government not owning the monopoly and second, setting up structure that permitted a competitive structure but in all of these places, the understanding that this was a particular and systematic set of problems that required a particular agency as opposed to the general principles of antitrust that are supposed to function. For those many areas in the economy that don’t have these basic structural problems, that’s where you have antitrust. When you have expert agencies, you don’t. New Zealand was the one place that actually bought this and in [Indiscernible] [0:02:14] said okay, we don’t need an expert agency. We can just have antitrust. Okay. So they put together – they didn’t like what they got. Twelve years later, they put together an expert agency. Five years later, they turned around. Now, they have structural separation. They’re all the way at the other end. So let’s be realistic about what this alternative is. Jon Nuechterlein: So just a quick one on the MFJ discuss the antitrust versus regulation issue. The FMJ was entered into at a time when the subject of that antitrust [Indiscernible] AT&T controlled 80 percent of the access lines in the United States. It was a monopolist subject to rate of return regulation. That is the sort of industry. Yes, it should be subject to the oversight of an expert agency. The antitrust [Indiscernible] don’t do very well in long term behavioral oversight of monopolies. So then we get to the real issue here which is, is this an industry that is spiraling into monopoly? And I’ve heard a couple of times here today that the sense that yes, in fact, that the telephone companies are going to fall apart and the cable providers will end up being monopolists in a broadband environment. I don’t believe that’s true. I – first of all, there is not just a competition between cable companies and telephone companies. Clearwire and other wireless providers also give consumers options as the commission pointed out in the broadband report. Clear wire will be an importantly – an increasingly important part of this scene. So, the ultimate question is what do we do to make sure that the industry doesn’t spiral into it, a monopoly if we have some control over that, if – and one way to make sure we don’t do that is to create these incentives for would-be entrants to invest. As I think we’ve read in the – I don’t have any personal knowledge of this but AT&T – I mean, I’m sorry. Verizon has indeed scaled back its FiOS plans. I don’t think it’s because of this. I don’t really know but if companies in Verizon’s position are making close calls about whether to deploy in new neighborhoods where it has no guarantee of a return on its investment and one of the issues is what sorts of regulation do I need to worry about including Title II type price regulation in the future. What is my calculus as to whether this makes sense? I don’t claim to know the answer to how this affects investment. I do know that a lot of investment analysts including Craig Moffatt from Bernstein Research and others have said that the FCC’s title to reclassification decision is disruptive and that it will on the margin tend to depress investment. I don’t know [Indiscernible] as an empirical matter. That’s what the analysts say. I haven’t personally looked into it. Kevin Werbach: Let’s take some questions from the audience. [Indiscernible] issue is quite – well, we’ve got a bunch here. Let’s see. Let’s [Indiscernible] who haven’t spoken yet. Can you get over here and just remember just to introduce yourself before you ask the question. Audience Member: Hi, [Indiscernible] with BT. In terms of your earlier question about the sorts of factors that would help the FCC survive its decision to reclassify, what about the argument that – I mean, these are all interconnected networks and there’s traffic costs and traffic gets shifted to deregulated portions. It increases unit cost on the regulated portions and prices paid on the regulated portions and perhaps that is a fact that has become obvious to the FCC. Perhaps it hasn’t. Over the last five to eight years, would that be a sufficient factor just to help it survive a challenge? Jon Nuechterlein: It couldn’t hurt. In the Comcast order that would have been an interesting that Judge Tatel was looking for. I noticed that in the Schlick memo he makes the point of saying there are 800 provider, incumbent providers offering Title II broadband service. None of them of course are price regulated although tariff thing is – right, he recognizes that that was a gap in the record that they created for the Comcast decision. My view is the Comcast decision doesn’t come out any differently. But does it help the Title II? Yes, maybe. Kevin Werbach: That was an issue that sort of came up in passing in the Comcast case, that the commission, you know, from the [Indiscernible] [0:01:37] of the court made a different argument than they had made in the order and so they considered it but they certainly mentioned it. Okay? So let’s go over here. Audience Member: [Indiscernible] [0:01:50] Communications Daily. If the chairman’s third way is adopted, how big or little of an effect could it have on eliminating some of the uncertainty that’s out there in the market? Kevin Werbach: I think we have a variety of views here on the extent to which there will be uncertainty. I mean it seems like there’s an [Indiscernible] that wants to jump in. There’s a couple of dimensions there. One is the legal validity of it, whether it will be upheld and then if it is, the forbearance process which we didn’t really get too deeply into but the question is, you know, is forbearance something that provides certainty or not and we’ve had a range of views here. Now, I mean, there are obviously other views as well. But certainly some investors are spooked by the prospect of multiple layers of uncertainty not just about what’s going to happen in court but what all this means given some of the – you know, some of the problems and regulatory distinctions that I had addressed earlier. Yochai Benkler: Which just suggests that uncertainty is in part a product of spin [Phonetic] [0:03:32]. That is to say what is interpreted as causing uncertainty, regulatory limbo, will Congress act, won’t Congress act, how long, how long do we need to wait. That’s one way of spinning it. We now know that there’s a problem is another. The idea that somehow, there’s an efficient market out there in the financial markets that exactly calibrates the risk one way or the other as opposed to this is a continuous subject of manipulation in terms of argument. That’s part of – that’s part of the story. If you’re talking about somebody trying to come down and say what is the analysis of what is the most likely thing to – within two years let’s say resolve, you heard I think the views here about the particular regulatory change. And relative to what? Relative to just doing nothing, relative to claiming that you’ll do Title I, relative to saying Congress will act and none of that is an objective fact. All of that is subject to arguments that are – that understand the consequences of what they say. Investment decisions themselves are part of the regulatory game of saying we will or we won’t in order to make the argument from the investment. Kevin Werbach: So who hasn’t spoken yet? Let’s see over here. [Inaudible]. Go over here, Jon. Lynn Stanton: Lynn Stanton, TR Daily. Susan mentioned that privacy is one thing that the FTC is interested in and when I go to discussions in that area, there seems to be a fair amount of if not consensus, at least lip service to consensus that privacy and security on the internet would not only help consumers but would help people that want to make money off of consumers because there will be trust. The consumers continue to buy things. And I’m wondering why that kind of argument is so seldom heard in this area of consumers being able to trust it when they put an internet address and they’re going to go to the place they want to go that things won’t be slowed down because it is being offered by a third party rather than their ISP. Jim Speta: Oh, well, when we used to call this the cable open access debate, I wrote a piece, didn’t realize the hornet’s nest I was getting into at the time. But that said, look, you don’t need this regulation because the providers of these services don’t have an interest in doing things their consumers hate. Now, the market may not respond as quickly as say, with Facebook’s privacy policies but, you know, I didn’t think that that’s an issue. I think the privacy regulation for my purposes is, you know, sort of uncontroversial. There’s an interesting question about the interaction between the FTC’s privacy regulation and what the FCC is talking about but I’m going to assume they’re going to resolve that on a – sorry, Jon, layers basis. Audience Member: So I guess my question – other than for Jon Nuechterlein. Audience Member: Because I think I know what your answer would be. But is there a way to execute reclassification for retail broadband internet transmission in a way that does not mean that you have to reclassify something else. Say, wholesale – as a retail facilities-based broadband internet transmission, that doesn’t mean that you have to – you aren’t also reaching non-facilities based transmission at the retail level or wholesale transmission particularly when you – if you have to recognize the fact that the FCC’s definition of the public traditionally has included not just retail mass market but also very small groups of wholesale customers. Jim Speta: I think yes. I mean I think you have to rehearse things like dominant, non-dominant, right? That sort of old history but I think that that would be the path forward but I think what you have to do doctrinally I think is the way – is raised on the first panel is throw it all in and then take it out by pieces but I think you can use things like dominant, non-dominant distinctions and facilities, non-facilities and selective. I don’t think – I think you can get there. I think it’s – what’s the opposite of munging? I mean, it’s hard. Susan Crawford: But this – the question actually indicates the preference for an expert agency because there is no chance that your local senator is going to be able to do that. Jon Nuechterlein: Can I answer your question even if I’m not allowed to? Yochai Benkler: You’re allowed. You’re just not invited. Jon Nuechterlein: Alright. So I think you’re asking, you know, about the private carriage, common carriage distinction. I mean, finding a non-dominance doesn’t get you out of Title II. It gets you the forbearance that the FCC says is going to give to everybody. Jon Nuechterlein: So, wholesalers who offer their services to on a somewhat standardized basis even to a small group of players will end up being classified under Title II. So Akamai for example which even though it’s not – doesn’t own the pipes itself offers to transport your data around the world and store them in its servers. Under reclassification, there would be a decent argument that Akamai is either providing a Title II common carriage service or private carriage service. Ultimately, the question would turn on – I think Harold Feld pointed this out in his blog entry recently on whether Akamai in terms of service with its customers are standardized and if you go in to Akamai website, you discover that in fact, it offers standardized terms of service to smaller business companies so it would be a common carrier to that extent. Kevin Werbach: If one assumed that they’re providing transmission service as that’s [Inaudible]. Jon Nuechterlein: Right. And they are arranged and they’re responsible for transmission services even though they [Indiscernible] [0:04:56] underlying facilities just as reseller – IXC resellers back in the 80s and 90s were considered common carriers even though they didn’t own the underlying facilities and this again gets to the point that this – the distinctions in the law now don’t track our intuitions about what makes sound public policy. David Chaffee: Hi, David Chaffee with US Broadband Report. Arthur Schwick [Phonetic] [0:05:30] suggested that internet over wire line should be regulated while internet traffic over wireless might not be. Shouldn’t internet policy be set regardless of the transmission medium? Susan Crawford: I think the commission is going to spend a lot of energy on that question. They’ll be very careful about it. I personally don’t – I would think that the functionality is what we’re looking for – we cannot continue to be ad hoc and unprincipled about this. So, there has to be a way where if the consumer is experiencing a function whether wireless or wire line in a similar way, it can be subject to this forbearance regime but the commission I know is very sensitive to this issue and I think the Schlick memo indicates that. Yochai Benkler: I also think that it in part depends on what the particular concern or target is. There are different infrastructure costs for setting up a wireless competitor. It’s expensive but it’s not the same market structure in terms of entry barriers as digging trenches and pulling a third wire. And so, there may be substantive differences where you say there are certain components of the service that limit competition on the wire line side that wouldn’t in wireless in which case you would say this is a context in which I don’t need. Just that this is a context in which the density is such and the wealth is such that I have three or four providers. And this is one of the things that you actually see with the contemporary European approach is they’re beginning to roll and say, okay, here’s an area where we have so much facilities-based competition of next generation. Okay, that we refrain here. That’s on the European side. This can be done here. That’s why you need the expert agency to be able to say you need it here, you don’t need it here. It may not at the end of the day need to be in all places [Inaudible]. It may just be in intermediate places that are not enough that is essentially a natural monopoly and you need eventually maybe rate regulation. I don’t know. I don’t anticipate it but this brings this whole question of the wireless. One of the unknowns is the degree to which wireless and wire line really will be perfect substitutes and there’s certainly a plausible claim and certainly this looks like for example where some of the investments by say AT&T and 4G relative to fiber to the node is going but that will be enough of a substitute that you won’t have a problem at all. That’s one theory about where the world will go and it will create a situation where you want to back off and not touch any of it because there’s real competition. Another pathway is the one that says, actually now, as it turns out, 500 megabits and 18 megabits aren’t the same and you can get there with another iteration or 320 with another iteration of DOCSIS 3.0. You can get there with fiber but nobody is willing to put it in the ground so you essentially have this kind of monopoly market. You need to be able to treat those differently because the economics are different and the possibility of competition is different. Jim Speta: I think we can be ad hoc but principled and have principles which are technology neutral but that the answers might not, that I can plausibly imagine and none of us up here are engineers that the answer of unreasonable network management differs, whether we’re talking about wire line or wireless. But that – but because we’re being ad hoc doesn’t mean we need different principles and Susan is right that a lot of what the FCC is talking about looks a lot like 332 in terms of principles. Kevin Werbach: [Inaudible] [0:03:02] just a couple of more and then we’ll wrap up. Audience Member: I’m – this first time I’ve heard you talk about both Professor Benkler and Professor Crawford about cable becoming a high speed monopoly. How would you endeavor to encourage competition, innovation and the FCC’s broadband plan that wants to encourage people to invest and innovate to create higher speeds is if they succeed then you say they’re a monopoly and then they need to be price regulated. How does that square? Susan Crawford: There are several steps in that argument that I might take issue with – all I was saying was that the FCC’s own report indicates – you know, makes a prognostication about what entities are actually going to be able to provide high speed video capable service in a couple of years. They say – they have some concern about that. They point to clear wire and 4G products and say maybe there will be competition there. I’m suggesting that there is nothing wrong with being a monopoly. This is – Yochai’s huge point here, there are – these services have natural monopoly characteristics. That doesn’t make them inherently bad. That just means there are high entry barriers. Cost decrease as you add more people to the network. It’s very hard for anybody to compete. Given that fact, how should the FCC react? That’s the question that’s being raised in the national broadband plan. Yochai Benkler: So maybe it’s helpful in this context to explain where this comes from, what’s the story and how it’s different from the way people were thinking 10 years ago. So, the big regulatory innovation of the reclassification to information services was this introduction of the idea of intermodal competition, of the idea that it was enough to get competition between DSL and cable, to get the kind of market discipline you need when you move away from regulation. That assumed that the upgrade path, the path from nothing or dial-up to broadband was roughly equivalent for cable and for telephone and that getting somewhere around half of the market would pay for that upgrade path. So you had two – with at least two. Now, the theory was also broadband over power line and wireless and the cost in all of these upgrades would be equivalent but those didn’t work out but at least those. One of the things that has happened with the introduction of DOCSIS 3.0 on one hand and fiber on the other is that the cost of the upgrade path between these two potential competitors has become vastly different. Kevin Werbach: Alright. I want to get us out of here on time so I’m going to go to you next but I think let’s lead it into a wrap-up and I mean, Jon, if you want to briefly comment on that but then let me ask each of you. What advice would you give to the chairman of the FCC then today? So, they have announced – he has announced that intention to go down a certain direction and start a proceeding. What’s the best thing that the FCC should do in your viewpoint to move this forward in the right direction? So we’ll start over there with you, Jon. Kevin Werbach: We’ll start with you and come down this way. Jon Nuechterlein: Okay. Alright. Just quickly I don’t think we’re developing to a monopoly but if we are, the answer to that is to give the pipes with less role throughput, additional opportunities to compete. We have the dominant pipe through creative network management practices. Okay. Now, to your question, Kevin, I – I mean, Julius is in a very tough spot because he has got pressure on both sides. He has got pressure from the net groups community. He has got pressure from the industry. I would be spending a lot of time on the phone with Congress if I were Julius trying to hammer out a compromise. If I’m Julius, I don’t want to spend the rest of my tenure fighting about the set of issues and, you know, possibly losing at the end of it. Kevin Werbach: Go down there. Yochai Benkler: So I’ve essentially said what I think. I think that reclassification is the most plausible effective way of moving forward and not becoming irrelevant for a foreseeable future of regulatory limbo. In the process if that fact initiates and instigates a more rapid congressional process, that’s a positive side benefit rather than a negative. It also provides a safety net in case the congressional side fails to move forward. And so, that strikes me as the most valuable pathway. Reclassify, move forward on that proceeding and talk constantly obviously to Congress about what they’re doing in relationship to fix, to improve, to make it easier. Susan Crawford: I think the commission is headed down the right path. I think that there are many thoughtful lawyers and engineers inside the commission thinking very hard about these subjects. They don’t take it lightly. I would advise the chairman to think about his legacy. This is the key input infrastructure for communications of, you know, in the world and for the United States and it cannot be that he is relegated to sitting on the sidelines talking about wireless licenses which is what he’ll be left with if he doesn’t move forward with his reclassification. Jim Speta: Second best option, draft the statute. Circulate it. Draft it. Get those hardworking lawyers and smart engineers draft the statute. Best option, endorse the statute that I drafted in 2005. Jim Speta: With appropriate modifications. Kevin Werbach: Right. Alright. Well, thank you all for a really stimulating discussion.